Gnocchi. LOVE THEM! I experimented with several different techniques and I can’t decide which works better – baking the potatoes or boiling them. So, I give you both ways. I honestly can’t tell the difference. The most important thing you need for this though is a ricer and a gnocchi board. The ricer fluffs the potatoes and the board makes the ridges that give the traditional indentations to hold the sauce. Note: gnocchi freezes really well! Preheat oven to 350. Puncture potatoes with a fork and bake for an hour and a half. Or, peel and boil the potatoes until soft. If you baked the potatoes, let them cool so you can handle them. Break them in half and squeeze the potato meat into the ricer, 2 or 3 at a time, and press them over the baking sheet, fluffing as you go. If you boiled the potatoes, let them cool so you can handle them. Place them into the ricer and press them over the baking sheet, fluffing as you go. Place the sheet in the refrigerator. When the potatoes are completely cold, fluff them up with your fingers. Dust 1 cup of the flour and salt on top of the potatoes and mix together. Add the olive oil and knead until it forms a ball of dough. Add more flour and/or olive oil, if necessary. Cut the ball of dough into 8 sections. 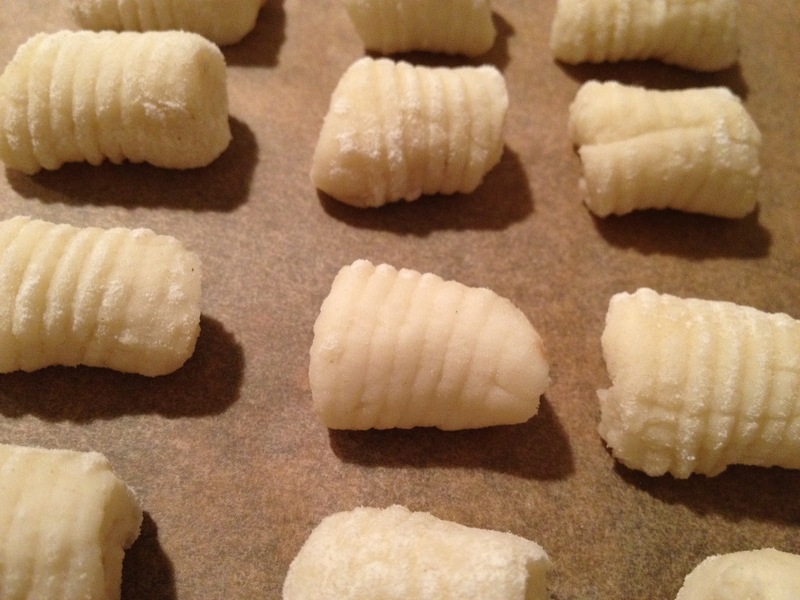 Make a long rope out of the section and cut into little gnocchi pillows. Roll on the gnocchi roller with your thumb and place onto another baking sheet. To cook, bring a big pot of salted water to a boil. Using a spider strainer, drop the gnocchi into the boiling water. If frozen, just pour them right in. As the gnocchis cook, they will float up to the top. Cook them for a minute after they have risen to the top so they get extra fluffy. Take out using the spider strainer. Serve with homemade tomato sauce, olive oil and garlic, cashew parmesan, etc. Enjoy!